Queen's Knickers Certainly Won't Be Pants! It’s time to get your knickers in a twist as Nicholas Allan’s charming and irreverent book The Queen’s Knickers is brought to life in this celebration of the garments we all wear but never show, at King’s Hall Ilkley on Tuesday 21 October at 1.30pm and 4pm. In this perfect autumn treat for children aged 3 and up, two inventive performers play the Queen and her maid Dilys, who is the royal custodian of the Queen’s ‘intimate apparel’. But then the Queen’s knickers go missing, causing a national state of emergency. 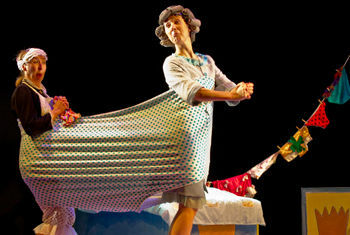 Bursting with music, puppets and imagination The Queen’s Knickers was first performed at the Southbank Centre and is now on a national tour. Join in the mayhem of the search for the royal undergarments in this perfect opportunity to introduce young children to the magic of theatre in a relaxed atmosphere.